As every cat owner knows, nobody owns a cat. As you can see, I have not posted in half of a year. Much has been going on in that six months and it is my intention to tell about it all, but today I am writing because this is the day we decided that the deteriorating health my 19-year-old cat was causing us all to suffer, him most of all and me second. Being empathic has its downside and for the past year I have had increasing abdominal / digestion issues. While I did not have persistent diarrhea as Jamie did for the past year, I still felt like I should. I was waking every morning for the past four months with everything hurting. I was in tears about this as I told my husband about it a few weeks ago, that I was not shaking it, and the pain and tiredness was affecting my ability to function physically during the day and maybe even my mind somewhat. I felt just plain...well, old. Knowing that I do not shake things that I am picking up from another person, particularly one I am around often, my husband suggested that it was coming from Jamie. I did not want to accept this, but I knew it was true. Jamie was barely holding his weight; he had lost muscle tone as old cats do and I could feel most every bone in his body. My husband began talking to me about it being his time and I would say not yet, but this last week, I began feeling a change, like Jamie's health was about to take a turn and worsen quickly. Although, this morning he seemed the same as he has for the last few months in energy and mobility, I still felt there was a change that we had not yet seen. We had made the appointment with the vet for this afternoon, but I was still hoping that I would feel differently before then. My daughter asked about having the vet look him over and maybe give him medicine, but some days he could barely digest food without problems; I just knew that giving any kind of medicine would probably do more bad than good for him at that point. The vet's assistant said as much considering his age without our prompting. Jamie has never been good at traveling in cars. The trip to the vet was one of his worse experiences and he was quite a mess when we arrived. We cleaned him up and wrapped in a towel holding him like a baby, I entered the office. Jamie in his younger days would have been protesting and fighting me all the way, but today he just let me hold him without a struggle or a sound. It is very difficult to say good-bye to a furry friend that has been with you for nearly two decades, but I just kept musing how only a cat that annoying could live so long and I hope that heaven is ready for him! I picked Jamie at an organization called Friends of Strays in Florida. He was half-grown and caught my attention with his personality when he picked up my husband's keys and began to walk off with them as if he owned them. When he came home with us, he decided he owned me and he was very demanding of my attention when he wanted it, which was always when it was the least convenient time for me. When I did not drop everything as he wanted or did not allow him on my lap, he would do something right in front of me that he knew I would not allow, like jumping on top of the hutch of my desk, or messing with papers on my husband's desk or walking on the kitchen counters or the dining table. I would yell at him telling him to come to me, which he would do with this vocal protesting all the way--sometimes across the entire room--that was reserved strictly for this ritual. He then would jump into my lap and I would scold him, sometimes even giving him a few pats on the rear end. During this whole routine he would purr and I think he even smiled, because now he was exactly where he wanted to be and would snuggle up in my lap. Jamie loved those little mice covered with rabbit fur that rattled. He would chew off their rabbit fur tails. He would fetch the tailless mice when I tossed them across the room and bring them back to me. He would play with them by himself if he had to, but he liked an added degree of difficulty, like them being just barely in reach under or behind furniture. I once bought him a bag of twelve mice like this for Christmas only taking one or two out each time because he would lose them. When we could not find any of them I would begin a serious search and I found six under the oven once. However, Jamie has not played with anything that took more effort that a couple of smacks with a front paw for years. Jamie always barely tolerated children, dogs, and other cats, actually pretty much anything to which I gave my attention other than him, so that list must include computers too. My daughter has a scar right next to the outer corner of her eye; she was toddler when she got that one and thankfully it was a hair's breadth from catching and ripping the corner. She also has three scars on her chest from when she picked him up and he decided he did not want to go downstairs for the night; she was older and feeding him then, but he had not quite warmed up to her. Despite his first impressions of her, the last few years he was sleeping with her until we would take him downstairs to the office in the basement. We did this only because in the morning he would often not bother to make it to the cat box down there and leave us a present on the carpet or even the bed. Oddly, he had always made it to the box for urinating, for which I am thankful. Jamie had quirky ways. When he was young, he used to run to the front door at the sound of a doorbell and look threatening as if he was a dog, even beating our Collie, Jasmine, who was over friendly to everyone. Jamie would even attack people sometimes, but when our first German Shepherd, Sasha, grew up, he took the alpha position from Jamie and his loud bark would send Jamie cowering to the downstairs. He became leery of strangers at the door from that time on. Jamie would bother people who did not like cats or were allergic, although most people did not have as much reaction to Jamie as they did other cats. He would check out strangers and their belongings, sniffing purses and sometimes jump in their laps and look at me to see if I was jealous. As soon as I called him over he would come, unless the person did not like cats; he seemed to enjoy torturing them more. If I was doing something so I could not let him be in lap at the time, he would sit on my husband's lap and glare at me until I move in such a way he thought he could squeeze onto my lap. He also had this way of sneaking up slowly as if he did not know that once he stepped on me, I would know he was there no matter how he approached me. My absolute most terrifyingly favorite thing that Jamie would do, when he was younger and still able to jump great heights, was to jump on me. He would do this if I was standing up talking on the phone and not paying attention to him (when obviously he wanted my full attention). The first time there was no warning, I just suddenly had a cat at my chest sliding down with nails out slicing through clothing and skin. I began to know his body language to recognize what he planned to do and I even used to run away from him until I would let him corner me and then I would catch him in the jump. It saved my skin and I think he like it better too. It have been some years since he stopped this, but he would still stretch up on my legs as if to say he wanted to be up there and I would pick him up. Jamie also loved to play hide and seek. So did Sasha. The problem I could not play it with the two of them because our 70 pound Sasha would run over poor Jamie, so I would only play hide and seek with Jamie when my husband took Sasha outside. Jamie caught on fast and would look for me as soon as Sasha headed for the door, meowing to beg me to play the game. We thought Jamie had become completely deaf--maybe he did for a time--he was definitely hard of hearing. It was very easy to startle him these last years without meaning to do so. A startle had become popping his head up from a nap and looking around with wide eyes. This was definitely a more mature method than his younger days when when he would jump at at least a foot straight up from all fours and it was always as much as a surprise to me what would scare him as it was to him. Jamie being surprised was always something would send me into deliciously lasting giggles. When he was young, he expressed his fear of things by challenging them. His first experience with a vacuum cleaner was beyond comical. Apparently he did not like the noise it made at all and he ran away. Once it was turned off, he slowly approached it, circled it, crouched, gave it two slaps and ran away. He did this several times for the next 30 minutes varying his technique one way or another, sometimes he would run past it with one glancing blow, sometimes he boldly square off and jump at it, and so on. He never did like that vacuum cleaner. I have always told people Jamie was the most annoying cat I ever had and he was the longest living also. It is amazing how big a hole in my life a furry annoying thing can leave when absent. 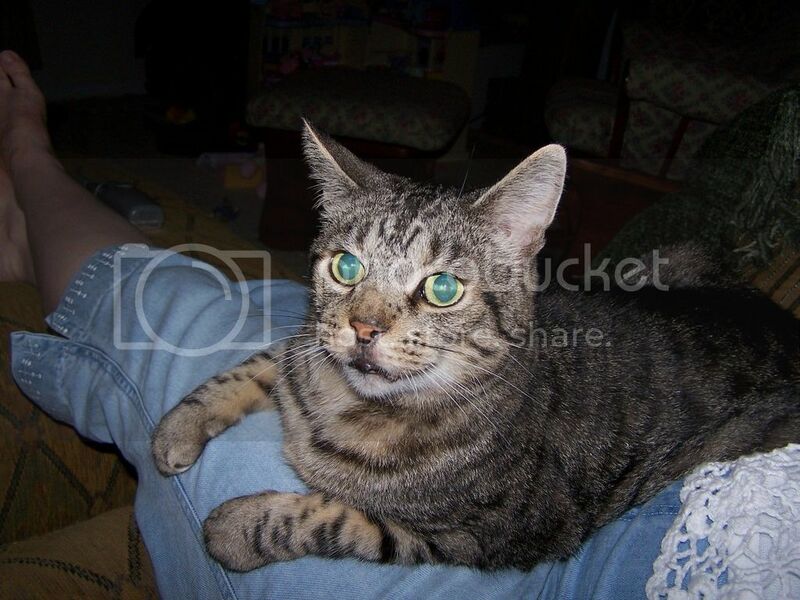 Jamie, vibrant at age 9, on my lap, where he always wanted to be. He definitely was loved and the why still has me baffled. I think I just was totally unprepared for a cat who could use that bad boy routine with the break-up to make-up hook so effectively. In his mellowed years, the Princess fell for it too and started calling him her cat; I think he liked the idea of two women fighting over him even more.